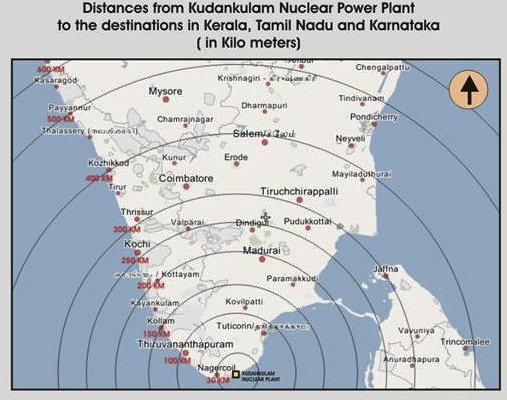 We have been fighting against the Koodankulam Nuclear Power Project (KKNPP) since the late 1980s. This Russian project was shelved right after the Soviet Union’s collapse and taken up again in 1997. The Indian government and Russians have constructed two huge reactors of 1000 MW each without the consent of or consultation with the local people. We have just obtained the outdated Environmental Impact Assessment (EIA) report after 23 years of long and hard struggle. The Indian nuclear authorities have not shared any basic information about the project with the public. They do not give complete and truthful answers for our questions on the ‘daily routine emissions’ from these reactors, the amount and management of nuclear waste, fresh water needs, impact of the coolant water on our sea and seafood, decommissioning costs and effects, Russian liability and so forth. We are deeply disturbed by all this. Our people watched the Fukushima accident <http://www.democracynow.org/topics/japan_disaster> of March 11, 2011 on TV at their homes and understood the magnitude and repercussions of a nuclear accident. Right after that on July 1, 2011, the KKNPP announced the ‘hot run’ of the first reactor that produced an alarming amount of noise and smoke. Furthermore, the authorities asked the people, in a mock drill notice, to cover their nose and mouth and run for their life in case of an emergency. As a result of all these, our people in Koodankulam and Idinthakarai villages made up their minds and took to the streets on their own on August 11, 2011. Then we together decided to host a day-long hunger strike on August 16 at Idinthakarai and a three-day fast on August 17-19 at Koodankulam. On the first day of the fast, authorities invited us for talks and asked us to postpone our struggle to the first week of September because of the upcoming Hindu and Muslim festivals. In a few days’ time, the chief of the Department of Atomic Energy (DAE) announced that the first reactor would go critical in September 2011. See the Times of India coverage . So we embarked upon an indefinite hunger strike on September 11, 2011 and our women blocked a state road on September 13 for a few hours when the state and central governments continued to ignore us. The state Chief Minister invited us for talks on September 21, and passed a cabinet resolution the next day asking the central government to halt all the work until the fears and concerns of the local people were allayed. We ended our hunger strike on the next day but went on another round of hunger strike from October 9 to 16 when the talks with the Indian Prime Minister failed. We laid siege in front of the KKNPP on October 13-16, 2011 when the KKNPP authorities did not halt work despite the Tamil Nadu state cabinet resolution. We ended both the indefinite hunger strike and the siege on October 16 in order for our people to participate in the local body elections. From October 18, 2011, we have been on a relay hunger strike. We have been carrying out massive rallies, village campaigns, public meetings, seminars, conferences, and other demonstrations such as shaving our heads, cooking on the street, and burning the models of the nuclear plants. When the state government of Tamil Nadu arrested some 200 of our comrades on March 19, 2012, fifteen of us embarked on an indefinite hunger strike until March 27. This struggle has been going on for more than 260 days and the morale of the people is still high. On May 14, a public hearing “Koodankulam and State Suppression of Democratic Rights” was held in Chennai. The next day relay hunger strikers took over from those who were on an indefinite strike. There is no foreign country or agency or money involved in this classic people’s struggle to defend our right to life and livelihood. Our fishermen, farmers, workers and women make small voluntary donations in cash and kind to sustain our simple Gandhian struggle. Our needs and expenses are very few. We only provide safe drinking water to the hunger strikers and visitors. People from all over Tamil Nadu (and sometimes from other parts of India) come on their own arranging their own transportation. For our own occasional travel, we hire local taxis. Instead of understanding the people’s genuine feelings and fulfilling our demands, the government has foisted serious cases of ‘sedition’ and ‘waging war on the Indian state’ on the leaders of our movement. There are more than 200 criminal cases against us. Police harassment, surveillance by intelligence officers, concocted news reports in the pro-government media, abuse of our family members, hate mail, death threats and even physical attack have become a daily part of our lives. Although India is a democracy, our central government has been keen on safeguarding the interests of the multinational corporations, and pleasing powerful countries such as the United States, Russia, and France. The welfare of the ‘ordinary citizens’ of India does not figure on their list of priorities. The central government and the ruling Congress party stand by the secretive nuclear agreements they have made with the different countries, and consider us as stumbling blocks on their road to development. The main opposition party, Bharatiya Janata Party (Hindu nationalist party) is equally interested in the nuclear weapons program and making India a superpower and hence loves everything nuclear. It is ironic that these two corrupt and communal forces join hands with each other against their own people. They bend backwards to please their American and other bosses but question our integrity and nationalist credentials. Our leaders and the group of fifteen women were physically attacked on January 31, 2012 at Tirunelveli by the Congress thugs and Hindutva fascists when we had gone for talks with the central government expert team. Now the government cuts electricity supply often and indiscriminately in order to drive home the message that nuclear power plant is needed for additional power. They try to create resentment and opposition among the public against our anti-nuclear struggle. To put it in a nutshell, this is a classic David-Goliath fight between the ordinary citizens of India and the powerful Indian government supported by the rich Indian capitalists, multinational corporations, imperial powers, and the global nuclear mafia. They promise foreign direct investment, nuclear power, development, atom bombs, security, and superpower status. We demand risk-free electricity, disease-free life, unpolluted natural resources, sustainable development and harmless future. They say the Russian nuclear power plants are safe and can withstand earthquakes and tsunamis. But we worry about their side-effects and after-effects. They speak for their scientist friends and business partners, and have their eyes on commissions and kickbacks. But we fight for our children and grandchildren, our animals and birds, our land, water, sea, air and the skies. S.P. Udayakumar is a member of the People’s Movement Against Nuclear Energy and the National Alliance of Anti-Nuclear Movements. He is one of the leaders of the non-violent protests against the Koodankulam nuclear power project in Tamil Nadu. He got his doctoral degree from the Political Science Department at the University of Hawaii at Mānoa in 1996. He is the author of Presenting the Past: Anxious History and Ancient Future in Hindutva India (Praeger 2005) and Handcuffed to History: Narratives, Pathologies, and Violence in South Asia(Praeger 2001).